EPIC was formed in 1989 by students committed to making public interest jobs accessible to Emory students. EPIC has successfully undertaken a major fundraising effort that has provided summer grants for students who accept volunteer positions or clerkships in public interest organizations. EPIC has the benefit of Emory Law alumni who are dedicated to public service and serve on EPIC’s Advisory Board. These attorneys work in legal aid, nonprofits, the public defender’s office, and law firms throughout Atlanta. Lifetime Commitment to Public Service Award: Paula Lawton Bevington, Principal, Bevington Advisors, LLC and Fundraising Consultant with Atlanta Legal Aid Society. Outstanding Leadership in the Public Interest Award: H. Lane Dennard, Jr., Retired Partner, King & Spalding and Co-Founder, Emory Law Volunteer Clinic for Veterans. Unsung Devotion to Those Most in Need Award: Linda A. Pace 75L, Chief Assistant Public Defender, DeKalb County Public Defender's Office, Juvenile Division. Lifetime Commitment to Public Service Award: Anne Emanuel 75L, Professor Emerita, Georgia State University College of Law. Anne clerked with Judge Tuttle following her graduation from Emory and in 2011 published Elbert Parr Tuttle: Chief Jurist of the Civil Rights Revolution. Outstanding Leadership in the Public Interest Award: Stan Jones, partner at Nelson Mullins. Stan has been involved in the mental health movement in Georgia since working on numerous gubernatorial and presidential commissions for the Carter family. Unsung Devotion to Those Most in Need Award: Rachel Epps Spears, founding executive director of the Pro Bono Partnership of Atlanta. Presented by Rev. Melanie L. Conner, Executive Director of the Zion Hill Community Development Corporation. The EPIC Book and Supplement Sales are held at the beginning and middle of each semester. To volunteer to sort or sell books, contact EPIC's treasurer. Why Buy From the EPIC Book and Study Guide Sale? You don't want to pay $130 per textbook multiplied by five classes. Upperclassmen don't want to continue to store books they'll never read again, especially on topics for which they have no interest. Nobody likes getting $25 back from the bookstore for a $130 book, and when the new edition comes out or the professor changes the text, you get nothing. EPIC needs money to pay for its event speakers, lunch at meetings, etc. In the spirit of public interest, and cleaning out our closet, EPIC will donate any books more than one edition older than the current edition in use to Liberian law students. Liberia's justice system is actually modeled after ours, so they use all American textbooks, American secondary sources, and even cite our Supreme Court cases in their opinions. The law students have very few books and no library. So we want to help out! Drop your books, supplements, study guides, flashcards, etc. in EPIC's donation bins. The bins are located at the bottom of the stairs connecting Gambrell Hall to the law library, just behind the small elevator. If I donate books, can I get a receipt for my taxes? The EPIC lunch series brings public interest attorneys practicing in various fields to the law school for a casual lunch with a small group of students. The attorneys usually talk about their experience in their current position, experiences that helped them prepare for their job, and other good public interest advice. This semester, we will have lawyers from the Georgia Innocence Project, Atlanta Legal Aid, and the Georgia Asylum and Immigration Network. Each lunch is capped at 10 students to ensure an intimate conversation and plenty of time for questions. EPIC provides lunch and students provide their own beverage. One of EPIC's major programs is offering grants for students who are spending their summers working in the public interest but are either unpaid or receive insufficient funding from other sources. Complete the 2019 EPIC Grant Application (PDF format) and 2019 EPIC Grant Application (Word format) by Monday, March 18, at 5:00 p.m.
Melba & Dean James B. Hughes, Jr. The Emory Public Interest Committee is pleased to announce our EPIC 2018 Conference, on October 6, from 8:30 a.m. - 4:00 p.m. 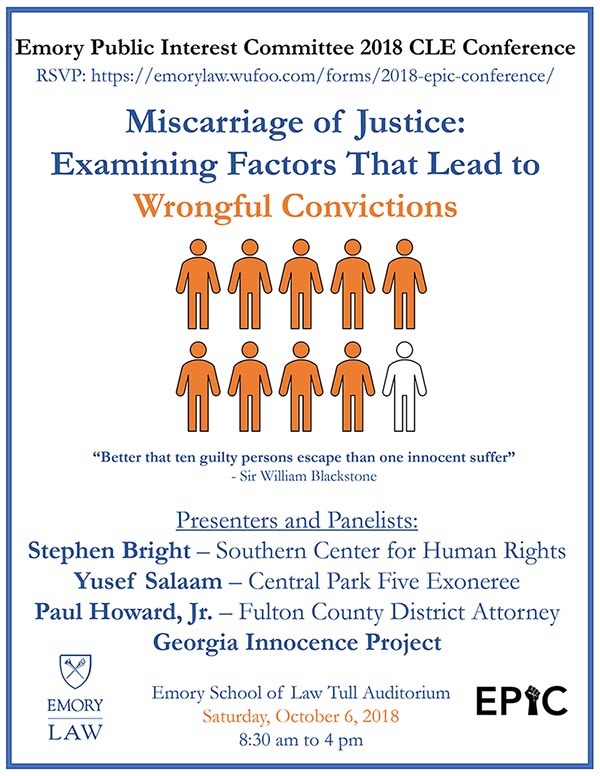 Entitled Miscarriage of Justice: Examining Factors that Lead to Wrongful Convictions, the conference will feature speakers such as Yusef Salaam (Central Park Five Exoneree); Stephen Bright (Southern Center for Human Rights); Paul Howard, Jr. (Fulton County District Attorney); and the Georgia Innocence Project. This conference will cover topics relating to Georgia Innocence Project's work, Death Penalty, Race and Eye Witness Identification, Access to Justice and the Appellate Process, Police and Prosecutorial Misconduct, DA Integrity Units, Ineffective Assistance to Counsel, and False Confessions. Miscarriage of Justice: Examining Factors that Lead to Wrongful Convictions is a CLE certified conference. Breakfast, lunch, and refreshments will be served throughout the day. We look forward to seeing you! EPIC Conference 2018 will be held in Tull Auditorium, located in Gambrell Hall at the Emory School of Law. Emory University has several parking lots and decks on campus with designated visitor parking areas. The visitor parking area nearest the law school is the Lowergate parking deck where there is free parking available on Saturdays. Stevens Fellowships provide financial assistance to students who will spend their summer volunteering at a public interest organization. First- and second-year students who have secured a full-time (40 hours/wk for 10 weeks) volunteer summer law position with a public interest organization may qualify. Qualifying employer organizations include legal services agencies and government offices (judicial externships do not qualify). Private sector "public interest" law firms will also be considered as qualifying employers as long as the position is unpaid and the firm provides a letter or other descriptive material that supports their "public interest" status. All applicants submit a letter from their employer confirming their summer position. The essay portion of the application should describe the applicant's commitment to public interest law. Beginning in 2019, applicants also must submit a separate statemnet as to how the work is consistent with the mission of the John Paul Stevens Fellowship Foundation. To make your gift online, click below, specify School of Law, and enter "EPIC" in the "Other Designation" field.